By what do we measure a man if not by his beard? We recently noted in an article about RADIANT EXERT IV by Eero Okkonen how quickly the builder is producing his human figures, but then he comes back with a double-whammy and shares another one, but with a much longer beard. And beards make everything better. Just to emphasise how fast Eero actually is, you can check some dates of when his latest creations were photographed! And if that wasn’t enough, the builder reveals at the end of his personal blog post that he still has six more figures waiting to be uploaded! 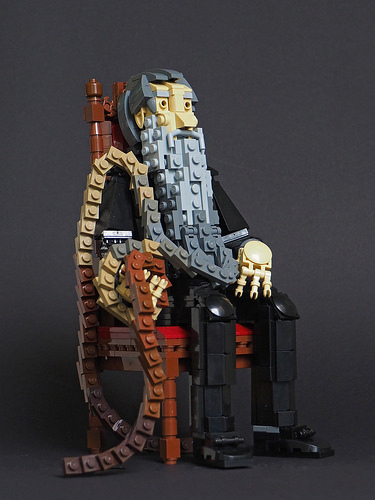 But if we focus on his build instead of how Eero is a LEGO building cyborg monster who never sleeps, we can see quite the figure of Hans Langseth, the record-holder for the longest beard in history. The scale really opens up many possibilities for details, like cheek-bones made out of 1×1 round plates and a handlebar moustache made out of… handlebars! The beard is a simple technique of stacking 1×2 plates on one another on one stud only, forming a chain that pivots on these individual connections, forming a rugged and easily formable shape. All this is put into a more real environment with the ornate chair Hans is sitting on.